: the activity of thinking too much or too deeply about yourself, your experiences, your feelings, etc. Well that pretty much sums me up. My name is David Kirchhoff, and I was formerly the CEO of Weight Watchers International. Now I'm on a "journey" to figure out what's next and to enjoy my currently untethered life. And yes, I'm still worried about my figure. There are several ways to see and tour a new place: by vehicle, by bike or by foot. Each has it’s advantages, and usually the tradeoff is the distance covered vs. the closeness of the observations. Today, I was on foot. The day started with me asking my guide what the level of intensity was of the day’s journey. His company rates different excursions as either easy, moderate or strenuous. He told me today would be a “moderate”. I must have looked a little sad, as he quietly decided to secretly combine two moderate trips into one. As he told me later, “a moderate plus a moderate equals a strenuous.” Travel math. The implication for me was about five and a half hours on foot. Neither my guide nor I was particularly talkative today during our long walk. We were both content to march along with only the occasional word being spoken over the five plus hours. The day’s journey took us from the backside of a large hill, over said hill, and across the Gangtey Valley (as it is known informally for the Gangtey monastery which it houses). The day was filled with long periods of quiet contemplation (and careful attention to manure avoidance), punctuated with quietly remarkable and touching moments. Meeting a 62 year old woman early in the morning as she was trudging up the hill with the milk she had just procured from the yaks several hundred feet below her village. She has been doing the same thing every day for over fifty years. She was a landowner, and the custom would be for her to pass down her land to her eldest daughter. This tradition is largely passing by as the younger generation leaves the rural communities for jobs in the rapidly growing cities leaving the older generation to continue working their land. Making our way up to her tiny, tiny isolated village that only received electricity within the past year. While this little village is only a few kilometers as the crow flies from the more populous parts of the valley, its isolation is sealed by its lack of road access and the fact that a jaunt to the next village requires a fairly major climb and is a two hour proposition. Coming across a family in said village in which a twenty-something mother weaves yak hair into a loom while chatting away on her mobile phone. Being amused as her insanely cute kids giggled and laughed at yours truly (who can blame them). 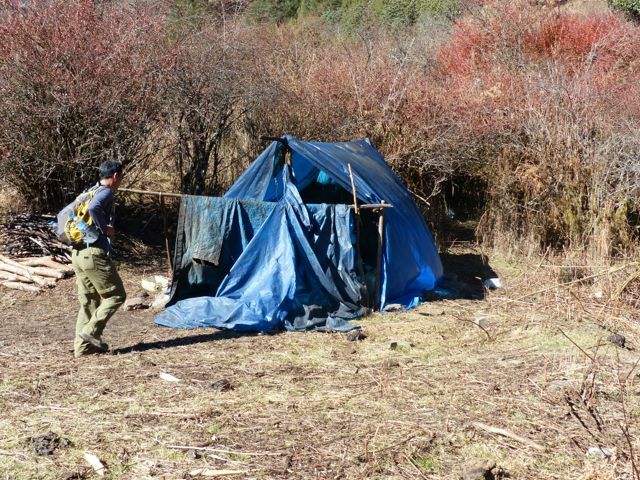 Coming across makeshift tents that housed nomadic yak herders. Wondering what that life would be like? 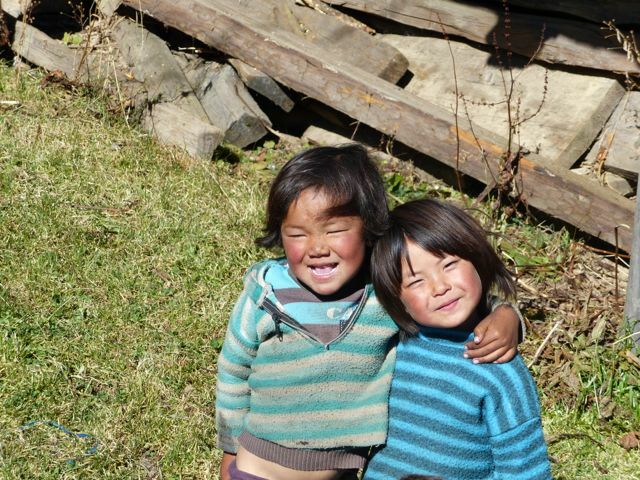 Does it feel hard to the yak herder or is it just like anyone else’s life as they have never known anything different? Never surprise a yak. It makes them want to gore you. I suppose this means sneaking up on a yak and yelling “Boo!!!! Ha! Ha! Ha! Ha!” is a bad idea. I assume that yak tipping is an equally terrible idea. So much for fun. 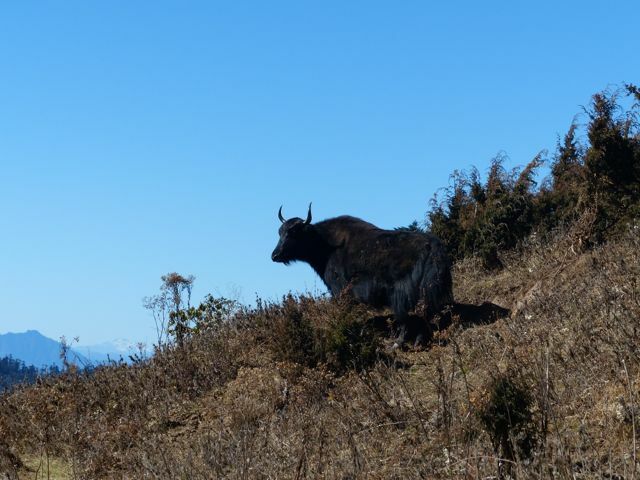 When encountering a yak, one should yell at it. Stinks for the yak, but good for you. 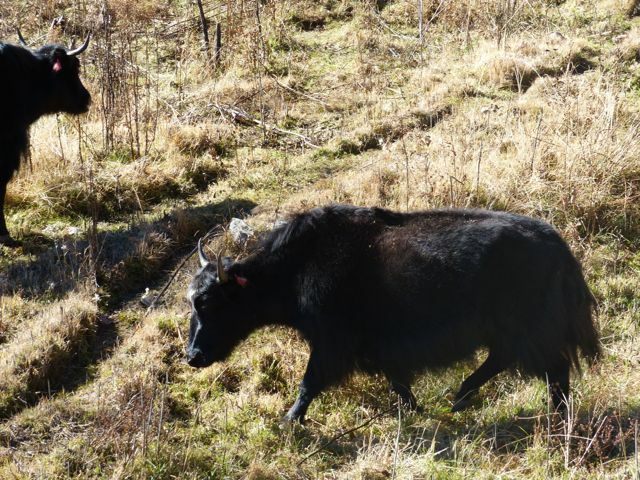 If a yak looks at you in a threatening way, consider throwing a rock at it. Again, stinks for the yak. If a yak charges, seek a large tree to hide behind. Seriously. Now you know better. You have no good reason for ever dying by the horns of a yak. Visiting another beautiful monastery, Gangtey (circa 1600’s), and marveling once again at the structure, art and spirituality of it all. And continuing to be touched by the invitation to make an offering and meditate in someone else’s house of worship. Stumbling upon a group of local villagers building a house for one of their neighbors. This is the traditional way of getting a house in Bhutan: the building materials are provided for free (enough to build a two story home) and the neighbors pitch in to help you build it. This tradition is also at risk as more and more people are being pulled to construction jobs in support of the burgeoning hydro electric industry, leaving no one to help build the house. Being invited by a young monk, estimated age of 12, to come into a 15th century temple with it’s various paintings of the different forms of the buddha applied directly to the stone. Watching a bunch of young monks playing soccer and lawn darts, and thinking about how they seemed just like any other group of young boys on the playground at recess. Finally, sitting in a wooden bathtub housed in a makeshift shed on the side of a hill while an old man put red hot stones into it. And then watching the sun set over the quiet valley. I could have experienced some of these on a rapid fire tour (e.g., the monastery visit), but I never would have seen most of it were it not for the time investment of a five and a half hour walk. It was a useful reminder of how much more I can see when I take the time to slow down and walk instead of barreling through life in a jet airliner.